You are here: Home / balanced / 3 Ways You Can Share God’s Love for $10 | Join the #GiveTen Challenge! 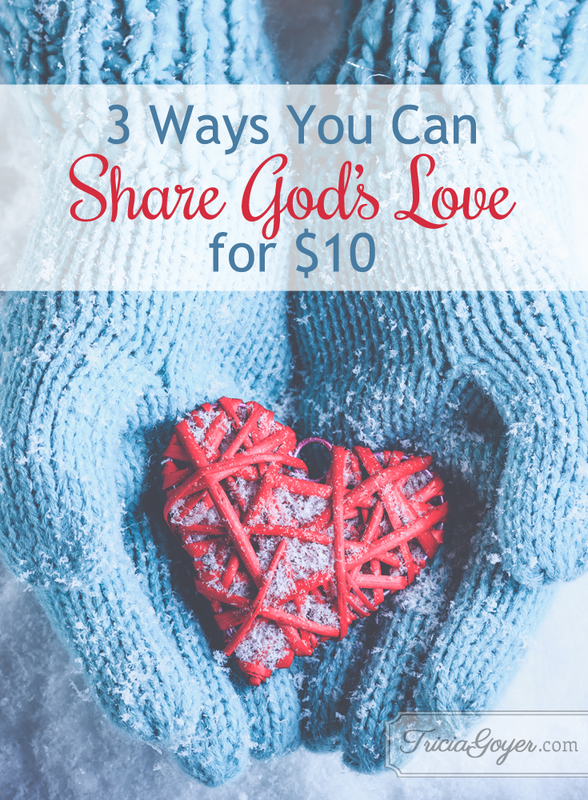 3 Ways You Can Share God’s Love for $10 | Join the #GiveTen Challenge! As the holiday season rolls around I hear a lot of “I wants” from my kids. Catalogs show up in the mail. Commercials flash on the television. Every store is filled with racks of glittery, flashy toys that draw my children’s attention. My children are too easily drawn to what they can get, and my goal as a mom is to show them what they can give. Here are 3 ways I’ve done that. We have participated in Operation Christmas Child for many years. 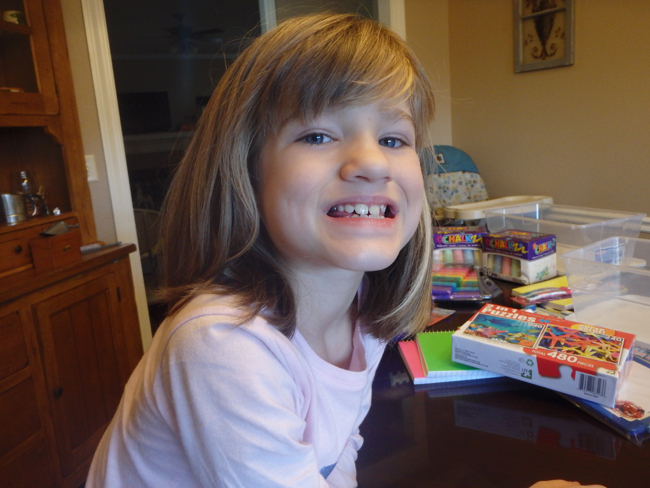 My children pack a shoe box with gifts and OCC sends that show box around the world, sharing the love of Jesus with children. The children receive gifts, but they also receive the Good News of Jesus Christ in a 12-lesson Bible Study Course. With a trip to the Dollar Store my kids and I were able to fill three boxes for $10 each. 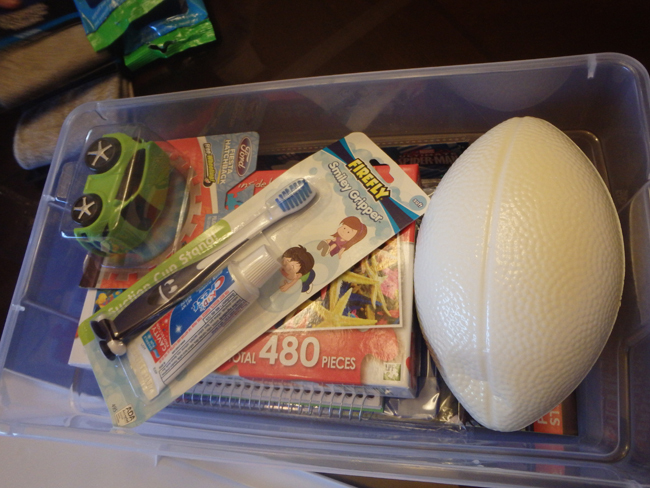 We filled them with puzzles, balls, toothbrushes, socks and more! I love that my children can choose gifts for another child on the other side of the world. You can visit samaritanspurse.org/occ to find out more about Operation Christmas Child. Every Thursday night on our drive to serve at a Teen Mom Support group, my children and I see the same homeless man. And every Thursday I hear the same questions from my kids, “Did he eat today?”, “Where does he sleep?”, and “Mom, can we stop and help him?” That’s when I came up with the idea that would could help … even with $10. 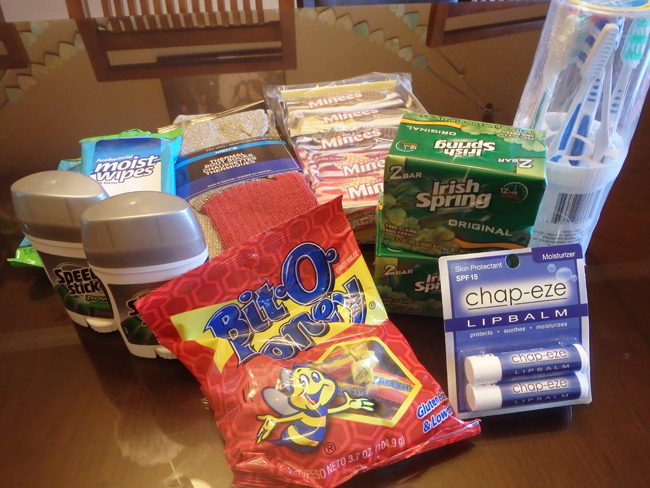 At the Dollar Store we bought snack items, a toothbrush, toothpaste, lip balm, wet wipes, soap, socks and more. 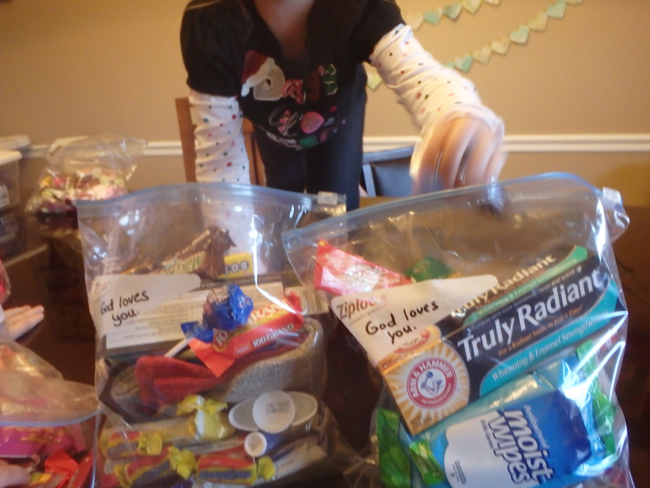 One of my daughters even included one of her small pocket Bibles and my youngest kids wanted to share their candy! We delivered the bag last night, and my kids were so excited to give I to him. And their new friend had a huge smile on his face as he received it. It’s hard being a mom. It’s even harder being a teen mom without many resources. Even at a young age moms sacrifice for their children. That’s why I thought it would be nice to buy some gifts and bless two young moms. 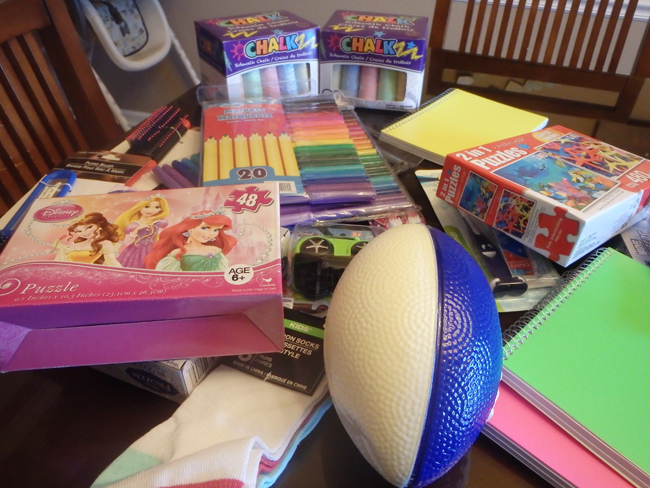 We visited the Dollar Store, and we gathered kitchen items for one young mom. 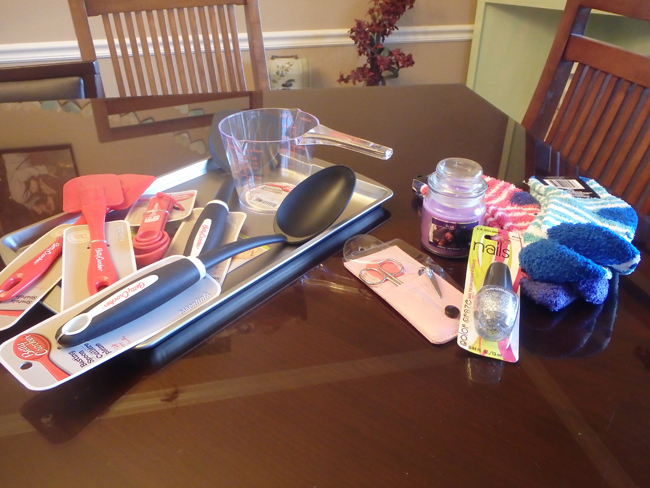 For the other young mom we bought items to pamper her, such as fuzzy socks and nail polish. I will be taking these items to our teen mom support group next week. We’ll be able to share with these moms that they are important to God and others, and they deserve to be loved! Do you have someone your family would love to bless this Christmas? 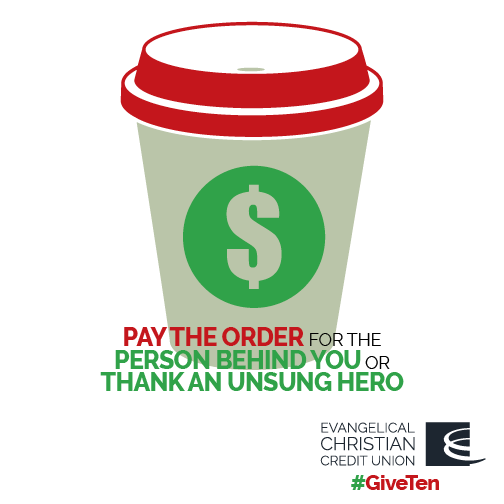 I’m partnering with ECCU for their #GiveTen campaign. It is a simple movement of Christians living out their faith – $10 at a time. I was so blessed to see the ways my children and I were able to work together to spread compassion, happiness and generosity for only $10. Now, it’s your turn! I’d like you to find the most creative way you can to share God’s love for $10. I’m SO EXCITED to hear what you come up with! Share your idea with me and ECCU for your chance to win a check for $500 to do more in your community. Wouldn’t that be fun?! I love when we all work together to share God’s love! ECCU is a full-service credit union designed for Christians. Their competitive checking, savings, investing and loan products help you do more with your money. So with every dollar you spend, you’re supporting ministry. At the start of the season of giving, now is the time where offering thanks and helping others is top of mind. How would you spend $10 to do the most good for someone else? Share your ideas and stories on ECCU’s Facebook page and enter to win $500 to continue blessing others! *Thanks for ECCU for sponsoring this post. All opinions are my own. Thank you for supporting all Tricia Goyer collaborations and sponsors.